Kashmir is a potpourri of lush green meadows, crystal clear lakes, colourful orchards, untamed rivers and towering peaks. The valley, secluded within the Pir Panjal and Himalaya Range, offers a host of outdoor activities in the mountains to enjoy the bits and bytes of nature. Camping in Kashmir finds an easy escape right in the lap of the nature and allows one to feel the exotic ambiance. Camping in the mountains in reality is a leisurely activity. For someone looking for a change in their holiday, and to stay away from the four walls equipped with modern amenities, camping in Kashmir is just ideal as it allows them an unparalleled outing. The Kashmir region, stretching from the golden meadows of Sonmarg and picturesque valley of Pahalgam to the Great Lakes in the midst of hulking high snow capped peaks, offers ample opportunity for camping. Over the years, camping in Kashmir has not only won the pedes accolades of trekkers but also the souls of leisure travellers. Pahalgam is the ultimate destination that is ideal for a quaint camping holiday in Kashmir. It brings forth a rich green valley that is dotted with pine trees and cut across by the River Lidder. 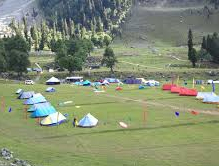 While camping at Pahalgam, one can go for short excursion to the Tarsar and Marsar lakes in the Upper Dachigam area and further embark on short treks to Lidderwat, Sheshnag, Panchtarni and Baltal making camping holiday in Kashmir more adventurous and beautiful. 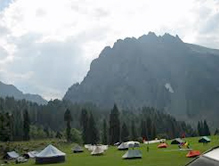 Camping in Kashmir is also possible in the valley of Sonmarg, which is also the staging point for some of the most popular treks in the higher altitudes in Kashmir. One can even go for a pleasant excursion to the Thajiwas glacier, which is approximately 8 kilometers away and further the notable Kashmir Great Lake Trek commences from the valley of Sonmarg. Camping in Kashmir is further possible in the breathtaking environment of Gulmarg.